We look through a client’s lens to get the right eyes on your property. Colliers experts deliver effective marketing plans that include the latest digital strategies to generate demand and attract credit-worthy tenants and investors. 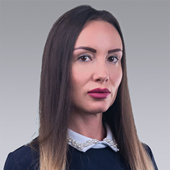 Vesela Petrova has been employed by Colliers International since 2004. As Operations Director, she manages the following business lines: marketing, research, HR, administration, design, change management. Prior to joining Colliers, Vesela was Management Assistant in TMF Services – international provider of accounting, HR and payroll, fund administration, real estate management and investment services.